Location is not everything. Exhibit A: Absolutely amazing Oaxacan tacos can be found in a small strip mall on Madison Road, overshadowed by a full-service car wash. Blink and you’ll miss Mazunte. But it’ll be your loss. Owner Josh Wamsley breathes soul into the simple digs, drawing inspiration from his time teaching English in southern Mexico. He overcame linguistic and cultural differences to soak up as much as he could about the ins and outs of Oaxacan cuisine. In fact, his restaurant is named after a small beach town on Oaxaca’s Pacific coast. Mazunte is all about the tacos and allows diners to mix and match flavors, each variety mounded on a freshly made corn tortilla. Sangria-marinated skirt steak tacos buzz with complex acidity and come topped with freshly minced pico de gallo and crumbles of tart goat cheese. The tacos dorados feature braised chicken and a fiery roasted red pepper sauce, and the fish tacos (available with the fish grilled or deep fried) arrive with a brazen yet balanced mango-habañero salsa and a creamy red cabbage slaw. Chip hounds will delight in the basket of fried, full-size blue corn tortillas and a salsa bar that runs the gamut of flavors and heat levels, from friendly to downright ferocious. 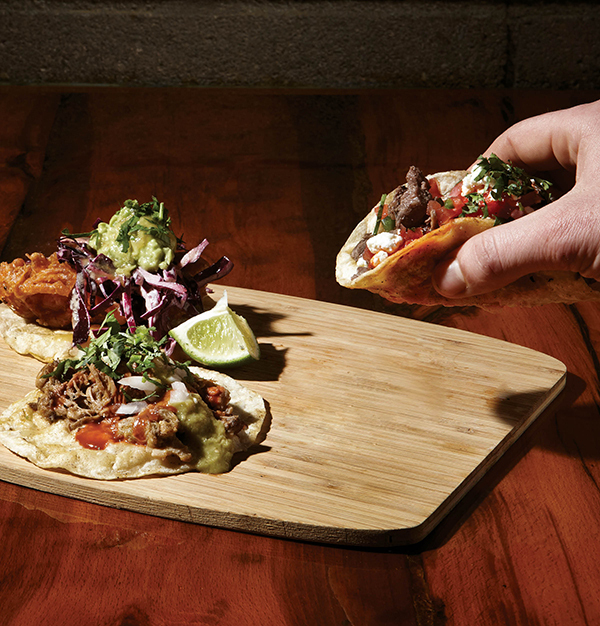 The east side of town has long been in need of some authentic Mexican. Viva Mazunte!